Though my political approval of and personal liking for Mahinda Rajapaksa, (certainly in relation to his competitors and immediate predecessors) are shared by nine out of ten Sri Lankan citizens (according to the Gallup poll), it is not nice to be alone in one’s analysis and evaluation, among one’s own social stratum, the intelligentsia, especially the English-speaking and writing urban intelligentsia. Therefore it is a good feeling when you discover that your views coincide with someone who stands above the fray, and cannot but evoke respect from all rational people. Nicest of all, is when the public personage with whose views your own coincide, has achieved a status and recognition that is truly global. My perspectives on Mahinda Rajapaksa, his administration, Sri Lankan politics and the issue of accountability and international pressure have been denounced by political partisans of almost all sides. The Tamil Diaspora accuses me of Sinhala chauvinism or neo-nationalism (as Taraki put it). The Sinhala chauvinists accuse me of being Eelamist because I support provincial devolution. The Left accuses me of having sold out to the Right. The Right accuses me of a dangerous Left radicalism in international affairs. The liberals who support international calls for boycotts and accountability hearings will never forgive my defense of Sri Lanka’s sovereignty in Geneva, May 2009. The Sinhala hardliners will never forgive me for my advocacy of provincial level devolution. The dogmatic Left regards Mahinda Rajapaksa as a Rightist. The cosmopolitan liberals and Diaspora Tamil lobbyists consider him the chief representative of the Sinhala Buddhist Right, without whose patronage that Right would not exist. The Human Rights constituency sees Mahinda Rajapaksa as the most authoritarian, autocratic and possibly fascist element in Lankan politics, and the main danger to democracy. I consider Mahinda Rajapaksa a centrist and a Bonapartist balancer. It is gratifying, in this context, to note that Cardinal Malcolm Ranjith, at the time Archbishop Malcolm Ranjith, had arrived at almost the same conclusions, and expressed them way back in 2009 to the US Ambassador. The Cardinal can hardly be accused of being a Sinhala Buddhist chauvinist. 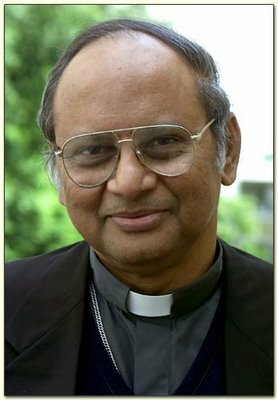 Even if one modifies the charge to one of Sinhala chauvinism, it is hardly credible that the world’s oldest and most far-flung transnational organization, a fount of ‘universality’, would choose a Sinhala chauvinist, representing under 20 million people, as one of the youngest cardinals in the world, and as the only Asian in the electoral college that finally chooses the Pope. Nor can the Cardinal be accused of being less than intelligent. Lack of intelligence is not a shortcoming that even the worst enemies of the Catholic Church would accuse it of, and with its high premium on training, we may readily conclude that a young Cardinal must be a very smart person indeed, with solid scholarly credentials and considerably wide and diverse experience. The Catholic Church being the sole social institution that cuts across Sri Lanka’s ethnic divide, or that social institution which transcends it most, it could be said that it is suitably positioned to articulate an inclusive Sri Lankan identity and ideology. Furthermore, a high ranking official of the Church, the most globalised and multicultural of institutions, is likely to provide a truly global and comparative perspective, and is least likely to provide a parochial one. It is against this backdrop that we must read Cardinal Ranjith’s reading of Sri Lanka’s politics, or more precisely, the US Ambassador’s reading of Cardinal Ranjith’s reading. “SUMMARY: Roman Catholic Archbishop Ranjith told ambassador that pushing the GSL too hard on the war crimes accountability issue now could destabilize Sri Lankan democracy and would set back the cause of human rights. He reasoned that weakening the Rajapaksas — who despite their public image were relative moderates in the Sri Lankan polity – could backfire. Moreover, if Sri Lanka were denied GSP-plus or the U.S. were to enact strong economic sanctions, leading to a sharp downturn in the economy, Sri Lanka could suffer revolution from the right or a coup by the military, which now had a very strong position in society. Ambassador countered that this was an interesting perspective, but if the Rajapaksas were in fact moderates, they needed to show it. END SUMMARY ». The cable says that “In a September 30 introductory meeting with Ambassador and Pol Chief, Roman Catholic Archbishop Malcolm Ranjith recounted the recent political evolution of Sri Lanka, of which he has been both an astute observer and important participant, and described the role of the Church in society. He noted that while he himself was a Singhalese, he was very sympathetic to the plight of Tamils, who had suffered greatly from pogroms and discrimination by the majority and from the disastrous results of LTTE separatist ideology. He explained that the Church had played a key role in brokering talks between the GSL and the LTTE over the years, including the 2002 cease-fire agreement. After the war, the church was advocating publicly for the release of IDPs and other controversial positions. This had led to criticism from the Buddhist right and even death threats against the archbishop himself. This was the opposite of the leading role in reconciliation the archbishop believed Buddhists should have been playing years ago. Despite this criticism, the archbishop said he believed President Rajapaksa personally was a good man and in the constellation of Sri Lankan politics was a relative moderate (he reminded us that Rajapaksa used to attend human rights meetings in Europe as an opposition MP). Rajapaksa and his brothers were under great pressure from the Singhalese Buddhist right, and any show of what would be perceived as weakness before the international community could result in their losing ground to much more extreme elements. Indeed, he argued that if something happened to the president there would be “chaos” in Sri Lanka. Two things that senior clerics know about are ideologies and to evaluate and judge the character of men. Cardinal Malcolm Ranjith characterises Mahinda Rajapaksa as essentially “a good man” and “a relative moderate in the constellation of Sri Lanka’s politics”. This should surely be taken into account.